Neil provided a very comprehensive feature recently on How To Perform A “Clean” Uninstall Of Pro Tools 11 On Windows 7 And 8 and in the comments there were questions of how to do this for a Mac, so here are some guidelines. There is no Trasher 10 option to undertake the archive process in the Mac world so you need to do this manually. 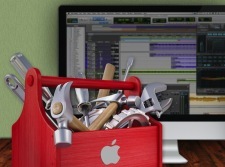 I have covered how to do this is detail in my Pro Tools Toolkit For Mac series in Groove 3. One of the videos covers this in detail. However the file locations vary depending whether you have Pro Tools 10 or 11. My video covers Pro Tools 10 but some of the files and folders are in different locations for Pro Tools 11. Obviously replace Boot Drive with the name of whatever you have called your Macintosh HD drive, the drive with your OS on it and Replace Your User Name with the name of the User account that you are logged into. Pro Tools Preferences are kept in the Preferences folder in the Library folder in your Home folder. It is not essential to archive these but they hold information like your favorite plug-ins, the Open Recent list and all the settings you changed in the Pro Tools Preferences window. The User Library folder is hidden by default. The easiest way to get to it is hold down the Alt key and access the Go menu in the Finder, select Library. A window showing what is in the User’s Library will open. Look for a folder called Avid. Inside that folder is a file called Pro Tools Prefs. That is where a lot of info is stored including Open Recent and what your Plug-in Favourites are. If you archive that before rebuilding the system and then put it back then that will keep all these settings. For Pro Tools 11 delete the Pro Tools application inside - Boot drive/Applications. Now run the installers, run the Pro Tools 10 installer first and then Pro Tools 11. Check both run fine before you reintroduce any of your backups. Once you are happy then copy back in your 3rd party plug-ins and presets as well as catalog and I/O settings but if there is a new fresh version, then use that, rather than your archived version.